LEWISTON, Idaho, Nov. 2, 2017 – Kenworth Sales Company recently unveiled the $4.95 million remodeling and expansion of its Lewiston, Idaho, dealership at a grand re-opening celebration with more than 200 customers, company representatives and community leaders in attendance. Responding to the needs of local truck fleets and operators and those traveling through central Idaho, the 18-month renovation increased the number of service bays from nine to 16, said Kyle Treadway, president and dealer principal of Kenworth Sales Company. It also nearly doubled the amount of parts inventory offered by the Kenworth PremierCare® Gold Certified Lewiston location. “We remodeled this facility with our customers clearly in mind, responding to their needs for faster service, improved access and security, increased on-demand parts availability and support from a greater number of knowledgeable technicians who can quickly diagnose their trucks and get them back on the road, increasing their uptime,” Treadway said. With 18,600 square feet of additional space, the now full-service Lewiston dealership at 1643 Old Spiral Highway has more than doubled in size and features a new 11,600 square-foot parts warehouse, comfortable lounge with recliners, work spaces, satellite television, vending machines, and new training facilities. The new training rooms allow the dealership to provide customers with on-site training and orientation related to new Kenworth truck technologies and vendor training for drivers and technicians. The training facility also allows Kenworth Sales Company technicians to receive on-site Kenworth and PACCAR Powertrain technical training, continually improving their knowledge and skills. “With room in our expanded warehouse for more than $800,000 worth of parts inventory, we’re prepared to meet the parts needs of our customers, including guaranteed parts availability for PACCAR MX engines,” said Aaron Brown, the Lewiston location parts manager. Along with the renovation, the dealership has expanded its hours of operation to 7 a.m. to midnight Monday through Friday and 8 a.m. to 4:30 p.m. on Saturdays. 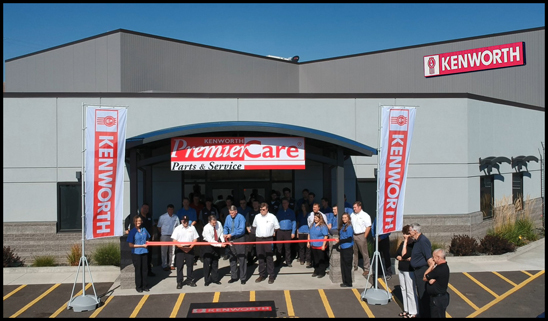 Located on 10 acres with convenient access to U.S. Highway 95 and U.S. Highway 12, Kenworth Sales Company – Lewiston has an expanded 16-bay service department with 2-hour truck diagnosis through Kenworth PremierCare® ExpressLane, and two bays equipped to service trucks with natural gas engines. Along with the additional space in the parts and service departments, the renovation features easier truck access and adds a fenced yard with security gate access and a drop site, where drivers can securely leave their loaded trailers while their trucks are serviced. Kenworth Sales Company operates a total of 21 locations in Idaho, Montana, Nevada, Oregon, Utah, Washington, and Wyoming. The Lewiston dealership joins eight other Kenworth Sales Company locations that have attained Kenworth PremierCare® Gold Certified status. Kenworth’s premier dealer service includes rapid diagnosis and estimated repair time within two hours or less, extended evening and weekend operations with at least 80 weekday hours and 8 weekend hours, dedicated Kenworth TruckTech+ Remote Diagnostics support staff, large parts inventory with guaranteed in-store stock of PACCAR MX engine parts and TRP aftermarket parts, comfortable and productive driver’s lounge, and Roadside Assistance. For more information, visit the Kenworth Sales Company – Lewiston can website.